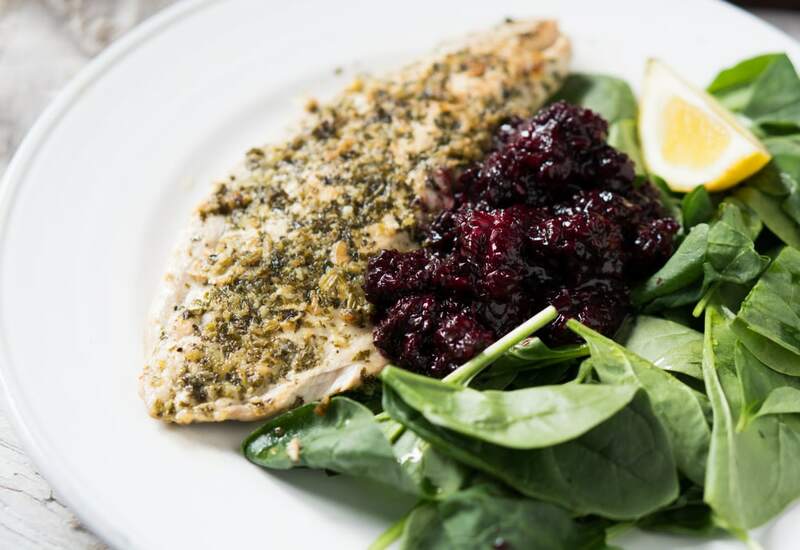 If you thought summer berries where only good for pies, you have to try this quick pan-fried fish with blackberry relish. It's super flaky, sweet, tangy, and deliciously fresh! White fish is marinated in a savory mixture of fresh herbs, lemon and garlic, then quickly pan fried for a quick, delicate protein. The blackberry relish is made with fresh berries, tangy red wine vinegar and sweetened with a touch of honey. Serve this sweet-and-sour main course with your favorite whole grain, with polenta or over salad greens for a light and healthy meal that's ready in 30 minutes. Try this delicious fish with boiled potatoes or over a bed of spinach for a lighter take. The relish would also be delicious served with an oilier fish like salmon, or with seared pork tenderloin. Try it with different berries—raspberries, blueberries or boysenberries would also work well. Per Serving: 502 calories; 23g fat; 35.8g carbohydrates; 41g protein; 149mg cholesterol; 340mg sodium. I had extra blackberries and wanted to cool savory recipe which led me to this. I served with crispy skin chicken thighs instead of fish -- SO GOOD! I wanted to like this dish, but the fish and blackberries together didn't work for me unfortunately. I love the blackberry relish on its own. I put some on top of a crostini with ricotta and it was sooo good! I would keep the fish separate next time and continue to make the relish for other appetizers. I skipped the fried fish all together and served this delicious relish with seared pork tenderloin. The sweet and salty just did it for me. It was so good. I also had with it with potatoes and sautéed spinach. Enjoyed this fish over a bed of spinach and arugula mixed together. Fresh blackberries worked perfectly for the relish. The blackberry was such a nice surprise. I made this mahi mahi, it was so good. Served it with organic spinach and purple kale together.